This perennial member of the daisy family (Asteraceae) usually has two or occasionally three flowers on a branched stem. It prefers fairly dry grassland. Common Cats-ear blooms from June through to October. Its seed heads are very similar to those of the dandelion. 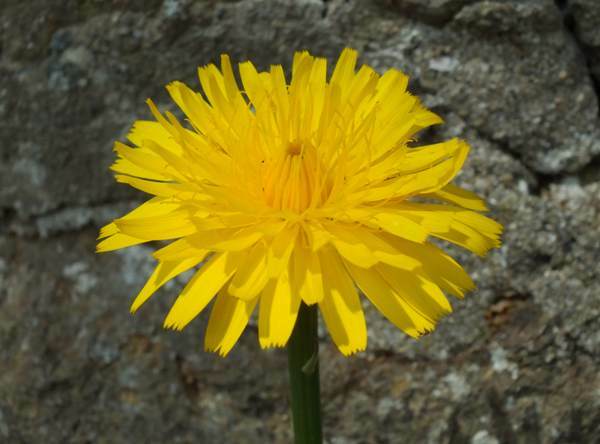 There are many other members of the hawkweed, hawkbit and hawksbeard clan; for the most part their flowers are very similar, and species are usually best distinguished by studying the leaves. One distinctive orange hawkweed, Pilosella aurantiaca, is commonly known as Fox and Cubs.